European average life expectancy has risen by six years since 1980. However in Ireland the improvement is even more marked. In the past ten years alone average life expectancy has improved from one year below the European average to one year above, lifting us from 18th in the European league to 8th. Although difficult to quantify, the contribution of modern health services to this achievement has been of unquestionable significance, with health research playing a vital but often under appreciated role. The Health Research Board and Beaumont Hospital have come together to try to better illustrate the practical benefits of research to patients. They have created a suite of posters and leaflets that set out the practical aspects and value of a number of HRB funded projects currently underway in Beaumont Hospital. On display in the hospital's outpatient clinics, the information can also be accessed through the two organisations' websites: Beaumont Hospital ¦ HRB. ‘Health research provides the knowledge that underpins improvements in healthcare and allows people to live longer and healthier lives. It provides patient with early access to new and innovative treatments, it improves the quality and efficiency of health services for the wider public and it attracts investment and jobs into Ireland. Mr Connolly added the HRB intends to undertake similar communication initiatives with other research-focused hospitals, informed by lessons learned from the pilot project with Beaumont. ‘There is a clear link between clinical excellence and high quality research and at Beaumont Hospital we aspire to be leaders in both. We are currently progressing plans to create an Academic Health Centre in partnership with Connolly Hospital and the Royal College of Surgeons in Ireland. Patient-centred research will be an essential element of this. The initial research projects on display have potential to improve care and outcomes for Irish patients but may well also have international significance,' he said. 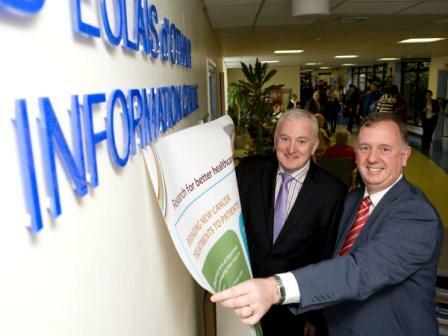 l-r: Liam Duffy, Beaumont Hospital Chief Executive, and Enda Connolly, Chief Executive of the Health Research Board.